When you look up into the night skies you will see a myriad of twinkling stars. With all of the stars in the sky you would have thought it would be impossible to recognise individual ones, but you would be wrong. Of course, nobody can recognise all of them but by starting to see patterns in the skies you can start to pick out individual stars and constellations and learn to navigate your way around. Going back thousands of years in time our ancient relatives used the stars to help navigate and needed to find a reliable way of determining which star was which and where it should be in the sky. To do this they started visualising patterns in the sky that meant things to them. Almost everybody in the northern hemisphere will have seen The Plough or Big Dipper in the Constellation Ursa Major. If you follow the line of the last two stars in up in the sky you will see the Pole Star or Polaris. This is the first important lesson in Astronomical Navigation: Polaris moves very little, almost standing still, all the other stars in the Northern hemisphere appear to rotate around it. Polaris is always in the North so having found Polaris you can always tell which way you are going on a dark night. As astronomers we all like clear dark nights with no light pollution, but there is one time when having some light pollution can help you. With lighter skies there are less stars visible which in turn means that you can only see the brightest stars. These stars are the ones that are used to create the patterns in the sky to define the various constellations. The patterns are like a join-the-dots puzzle where you draw lines between dots to realise the image. However in the case of the night skies there are a lot of dots that you don’t connect so having lighter skies means you see fewer stars and you can recognise the patterns more easily. Having found the right conditions to start our learning experience where do we start? I find that it is best to start with something that you can easily recognise and then move on from there to surrounding objects. For instance taking the above example we followed The Plough to Polaris. Polaris is the brightest star in the Ursa Minor constellation and is the end of the handle of the ‘little dipper’. Not everything will be instantly recognisable so it makes good sense to jump to another area of the sky that you can easily find. I have identified a number of easily recognised constellations to use as a starting point. A good example of this is Cassiopeia which is represented as a ‘W’ which can be clearly seen in most conditions. I often use Cassiopeia to orientate myself as the Plough is sometimes hidden from my view. Starting by looking at the first two stars of the ‘W’ and forming an equilateral triangle your sight drifts down to the Double Cluster, and beyond that to an inverted ‘Y’ which is the constellation Perseus. Coming back to Cassiopeia the last 3 stars form a triangle which I use as an arrowhead to follow to 4 bright stars in a line. This is the constellation of Andromeda. From Andromeda I locate the second bright star from the left, Mirach, and then turn at right angles. Moving along this line I see a slightly dimmer star, then continue the same distance again and I can now see the Andromeda Galaxy on a clear dark night. So starting with one easy to remember constellation and then using pointers to get to another part of the heavens is a good way to learn the skies, but what if you live in a heavily light polluted area, or there is a bright moon lighting the sky? In these circumstances I find it best to start looking for the brightest stars in the sky. In the summer and Autumn these will be Vega, Deneb, Altair and Arcturus. In Winter and Spring these will be Betelgeuse, Rigel, Aldebaran, and Capella. From these stars you can start to see the constellations surrounding them, Betelgeuse and Rigel are the two brightest stars in Orion, Aldebaran is to the east in Taurus with Capella just north and east. Getting back to where we started with the connect-the-dots it often takes a lot of imagination to see the form of the constellation. Cassiopeia is supposed to represent a seated, vain, queen but is depicted in the sky as a ‘W’. Easy to remember and spot, but hardly resembling a seated queen with a hand mirror. If we were to name the constellations today it may have been named after a fast food chain starting with ‘M’. More apparent is the constellation Cygnus (The Swan) where the outline of the swan is clearly visible. On a bright full moon night you may only be able to see one or two stars in Cygnus, but as the days pass and the moon wanes, more and more stars come into view until you can see the entire swan and wing tips. If you are lucky and live in or visit an area where the skies are really dark, with no moon, then you will be able to see millions of stars in our galaxy, the Milky Way. The Milky Way is a spiral galaxy and our Solar System resides in one of the spiral arms. This can be thought of like a plate, when you look at it from on top you can see the whole surface, but when you look at it from the side you will just see the edge. 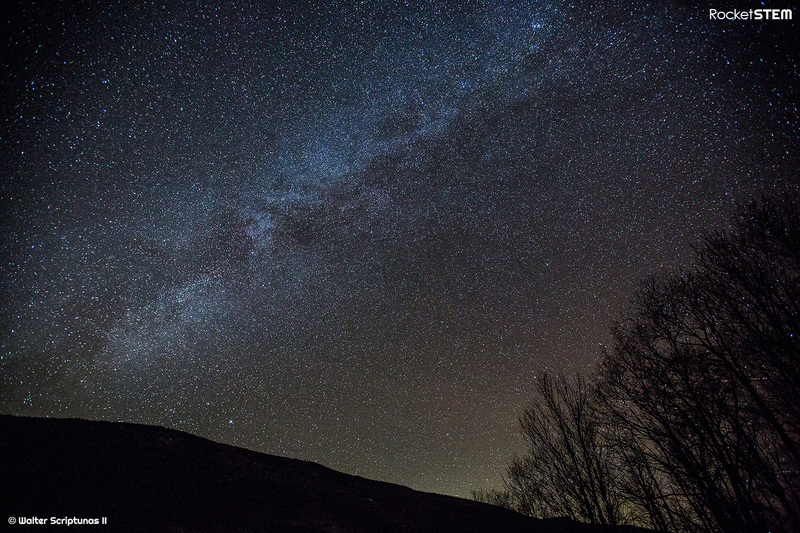 Looking at the Milky Way is like looking at a plate edge on. As the Milky Way is not solid like the plate we can see stars further away in the galaxy shining through. These are often quite dim stars, but the combination of the millions of stars illuminates the vast area of sky giving the appearance of a cloud. The Milky Way is a band that sweeps across our Summer and Autumn night skies cutting through the constellations of Cassiopeia, Cygnus, and Sagittarius. If you can see the Milky Way well than picking out the constellations can become a little tricky as you will be able to see so much more in the dark skies. This can sometimes make picking out the bright stars forming the symbolic structures problematic, one of the good reasons to start the learning process in light polluted skies. Having discovered the way to learn the layout of the skies you need help to identify them. This is where star charts come into play. Star charts are the maps of the sky, normally printed in a book, they show the relative positions of the constellations. Just like maps they help you navigate around the stars. In this modern day we live mainly in an online society, and astronomy has also found a place in the electronic annals of computers and the Internet. Star charts can be found online in a number of different formats, but as with road maps they are somewhat static images. The next evolution is planetarium software which can show you dynamically the sky at any location in the world, at any time to help you learn and discover the wonders to be seen. You don’t need to wait until the sun sets to start exploring. Of course this planetarium software provides an ideal view of the sky without factoring in light pollution, seeing conditions or the weather. All of these will combine to give you a less than ideal experience when you go outside to look at the real thing. This software does not have to be expensive, indeed Stellarium and Cartes Du Ciel are both excellent, free packages and will run on multiple computer platforms. Computers are not the only digital system to be of use in astronomy, the evolution of the mobile devices has redefined star recognition in the same way that Satellite Navigation revolutionised driving. There are a number of applications available for smartphones and tablets that enable you to point the device at the sky and will tell you exactly what you are looking at. Mobile planetarium software is really great for when you are learning, particularly when you are not quite sure what you are looking at. All you have to do it point the device towards the area of the sky you are interested in and it will tell you what you are looking at. There is a school of thought that says the mobile planetarium software is for lazy people who don’t want to learn the sky properly. It is true that reliance on technology is not always a good thing as witnessed by people relying on their SatNav completely and getting lost when it fails. Technology is a great tool to help with learning, but should never be a substitute for basic knowledge and skills. Learning anything ‘the hard way’ is always more rewarding than depending on something or someone else to do it for you. By all means seek out help from experts and all other resources, but try and learn the basics for greater self satisfaction.